The Torah begins with the power of God in creating the world simply by the spoken word, Bereshit / Genesis 1:3 Then God said, ‘Let there be light’; and there was light. (NASB, ג וַיֹּאמֶר אֱלֹהִים יְהִי-אוֹר וַיְהִי-אוֹר:) The first of God’s creation was not the sun, moon, and stars. The first of His creation, according to the Torah, was light. The rabbis teach this was the light of His Righteousness, where the light represents the righteousness of God. This is consistent with what John is saying in His epistle in 1 John 1:5-10. The Word of God is closely associated to truth and righteousness. Light and darkness are paralleled to righteousness and unrighteousness. When the Lord said “let there be light” His glory shown forth to give light and life to His creation. It is important to understand, the first of God’s creation, the light, represents His wisdom in righteousness and truth which is a fundamental component of the Gospel Message. This may be why the search for truth is a universal principle. The Lord God created and it was good, and the Lord placed man and woman in the Garden of Eden (Paradise) to tend the garden and take care of God’s creation. The only command He had given Adam and Eve was not to eat from the tree of the knowledge of good and evil. The events that take place after this are recorded in Bereshit / Genesis 3. Notice something here in Bereshit / Genesis 3:6 the text states, 3:6 When the woman saw that the tree was good for food, and that it was a delight to the eyes, and that the tree was desirable to make one wise, she took from its fruit and ate; and she gave also to her husband with her, and he ate. (NASB, ו וַתֵּרֶא הָאִשָּׁה כִּי טוֹב הָעֵץ לְמַאֲכָל וְכִי תַאֲוָה-הוּא לָעֵינַיִם וְנֶחְמָד הָעֵץ לְהַשְֹכִּיל וַתִּקַּח מִפִּרְיוֹ וַתֹּאכַל וַתִּתֵּן גַּם-לְאִישָׁהּ עִמָּהּ וַיֹּאכַל:) Eve saw the fruit and the Hebrew text states that the fruit looked good to eat (וַתֵּרֶא הָאִשָּׁה כִּי טוֹב הָעֵץ לְמַאֲכָל) and desirable for learning (וְנֶחְמָד הָעֵץ לְהַשְֹכִּיל). It is interesting how she simply looks at the fruit and considers it good to eat and good for learning. The difficulty with this statement is that one can taste that something is good, but one cannot know by looking at it that something tastes good. This is a very dangerous concept here, looking at something and considering it safe and wondering how it will make you feel? A parallel may be found for example, when one is initially presented with drugs, one asks himself “I wonder how this will make me feel?” “will it make me feel good?” and “no harm will come to me,” etc. Curiosity is a God given thing, but what we do with that curiosity, for sin or for righteousness is up to us. Here, Eve chose to learn what it meant to disobey God’s command. The command was for her good, and was not based upon the Lord simply trying to keep something from her. The rabbis have the following to say concerning these Scripture verses. וכי תאוה לעינים, “and that its appearance caused one to desire it.” We learn that man’s desires are activated by his eyes, by what he sees. ותרא האשה כי טוב העץ. Eve saw that the tree was good. The first problem is how could one judge what is good to eat by merely looking at it? Another question is why the Torah describes a feeling of the mouth before describing the effect on the eye? The verse should have read: “she saw that the tree was a beautiful sight and that it was good as food,” in that order. Furthermore, whence did Eve know that the tree was apt to add to her perceptive powers, i.e. לְהַשְֹכִּיל? If the Torah merely intended to tell us that the serpents’s description of the tree had been accurate, why describe the woman as seeing something that she did not see? Also why did the Torah add two superfluous words הוּא, and הָעֵץ a second time? If the repetition of the word is justified, why did the Torah not also write the word הָעֵץ after the word תַאֲוָה? The rabbis point out how a man’s desire is activated by what his eyes see (what he looks at). In this case, Eve desired what was forbidden. Or HaChaim points out how the feeling of the mouth occurs prior to the effect on the eye. This may be describing how hunger (our appetite) is paralleled to giving into the desires of the flesh. This is a significant observation because what we eat becomes a part of us, of who we are at a cellular level. Our appetite can effect our health and the way we walk. Yeshua spoke of what we eat as bringing eternal life (see John 6) drawing a parallel to eating and drinking of his body and blood, respectively. Note also how fasting is performed in order to starve the body (to beat down the body/desires-of-the-flesh), so we may walk in a more spiritual manner (according to the spirit) and draw nearer to the Lord God in prayer seeking His will and not our own. This is connected to the gospel message in the sense of repentance, humbling ourselves, beating back the body, walking in the Spirit, the indwelling of God’s Spirit (His leading us in our lives), the obedience to His Torah, and being a part of His kingdom. The Torah describes the things we are to turn back towards (repentance) to God’s holy and righteous ways. The Masoretic Text describes the events that follow their having sinned, the consequences of their actions, (the Snake, Adam, and Eve) and then the Lord providing for Adam and even skins suggesting that He had made the first offering for atonement for their sins. 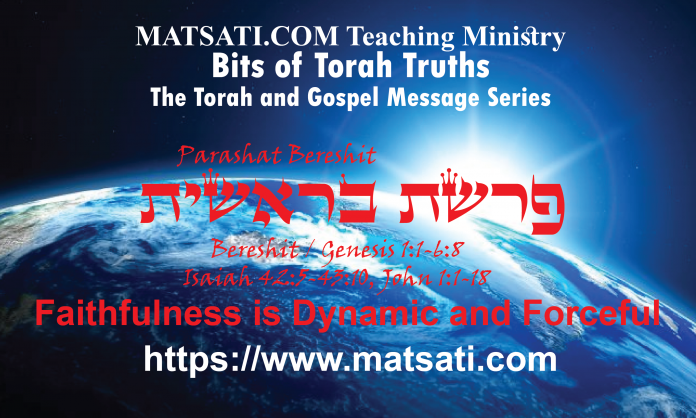 The basic tenants of the Gospel Message, to repent, to turn towards God’s Ways, and to seek His forgiveness, all come out of the opening Torah portion. All of these concepts are important and provide us with reasons for opening God’s Torah, reading His Word, and believing in our Father in heaven and His Messiah Yeshua. The Torah goes on to describe Adam knowing his wife. We read that they had a son, his name was Cain. He knew her again and they had another son, his name was Abel according to Bereshit / Genesis 4. According to the Hebrew Scriptures in Bereshit / Genesis 4:2 the text literally states, (וְקַיִן הָיָה עֹבֵד אֲדָמָה) Cain was a עֹבֵד (servant, worshiper, slave) of the adamah (earth, ground, אֲדָמָה). Abel on the other hand was a shepherd of the sheep (וַיְהִי-הֶבֶל רֹעֵה צֹאן). The parallels we find here, Cain being a servant of the world, he served the ways of the world, as opposed to the ways of God. The word Adamah as opposed to Eretz may parallel the nations and Israel, respectively, Cain chose the world, and not the Land of Israel (HaEretz) symbolizing God’s ways for His people. On the other hand, Abel was a shepherd who guided, nurtured, cared for others having a mind for God and His ways. Following Adam and Even eating of the fruit from the Tree of the Knowledge of Good and Evil, the earth was cursed (corrupted) as a part of Adam’s punishment to lifelong agricultural toil. This explains why the Lord God favored Abel’s offering of sheep (צֹאן) to Cain’s offering of fruits and vegetables. Note also how Cain killed his brother, the Adamah was complicit in Cain’s murder of his brother in that the ground swallowed Abels innocent blood as if to conceal the crime. The Lord God punished Cain by making the ground barren to him, and estranging him from the Adamah (the earth). The rabbis draw in an additional commentary on the word adamah (אֲדָמָה) speaking of the Hebrew word dam (דם) meaning “blood” and drawing a parallel to the purpose for the Kashrut on the prohibition of consuming blood. The blood of the animal must return to the ground and be covered over with earth. The rabbis pick up on the differences between the way the Hebrew text is written, and suggest an explanation as there being a significant difference between the two brothers indicated by their choice of vocation (work, job). Abel was righteous, and Cain was wicked (Note also the parallels we find later on between Jacob and Esau). The prophet Isaiah defines the difference between wickedness and unrighteousness. According to Isaiah, wickedness is related to what we do, and unrighteousness to what we think. The Lord God is not just concerned with what we do, but also in how we think. This comes down to having faith, and being faithful. The rabbis say that both good and evil have the same root, where the root is good, but in the case of two sons, one was good and one was evil. The rabbinic concept here is that “Seeing that both wicked people and good people developed out of the same root is proof that there was only One Creator, that evil and good are not separate domains, that there are no two competing deities in this world, one promoting the source of all that is good and promoting it, and one which is the root of all that is bad and promoting same.” The difference the rabbis are emphasizing is the way in which the text is written in Bereshit / Genesis 4:2, the description of Cain (וְקַיִן הָיָה עֹבֵד אֲדָמָה) and the description of Abel (וַיְהִי-הֶבֶל רֹעֵה צֹאן) and the reason for the Torah having written קין הָיָה, instead of ויהי קין וגו where הָיָה is written in the past tense (Cain was) and וַיְהִי the third-person masculine singular vav-consecutive imperfect. An Imperfect verb is used generally to indicate an action that is not complete, or an action that either occurs in the present or will occur in the future. The way the text is written, Cain “was” a servant of the land, this “was” a completed action. Abel on the other hand had not been completed in his work as a shepherd since being a leader and a teacher never ends, but is an ongoing process of learning and growing. In Cain’s case, the Lord God told him that sin was crouching at his door wanting to have him. (Bereshit / Genesis 4:6 Then the Lord said to Cain, ‘Why are you angry? And why has your countenance fallen? 4:7 ‘If you do well, will not your countenance be lifted up? And if you do not do well, sin is crouching at the door; and its desire is for you, but you must master it.’ NASB, ו וַיֹּאמֶר יְהוָֹה אֶל-קָיִן לָמָּה חָרָה לָךְ וְלָמָּה נָפְלוּ פָנֶיךָ: ז הֲלוֹא אִם-תֵּיטִיב שְֹאֵת וְאִם לֹא תֵיטִיב לַפֶּתַח חַטָּאת רֹבֵץ וְאֵלֶיךָ תְּשׁוּקָתוֹ וְאַתָּה תִּמְשָׁל-בּוֹ:) Cain did not turn from his ways, and his sinful thoughts brought him to killing His brother. What we are being taught here in Parashat Bereshit is of faith and faithfulness. Adam and Eve chose to disobey God’s command. Cain chose to be bring God a sacrifice from his own means, by his own ways as opposed to the way God wanted. Abel however lived by faith, and he died because he did what was right. The Torah explains to us how even in a perfect state, we are given to make the wrong choices and sin against God. We need God’s help to live a righteous and holy life. Paul in his epistles teaches us that faith enables a person to attain the righteousness of God and that there is no tension between faith and the Torah. The term faith is better understood as “faithfulness” because the concept includes much more than the English words belief and trust. Righteousness involves the redemptive work of God in His salvation process and in the renewed lives of those who are faithful. The idea of faithfulness is much more dynamic and forceful than the motionless idea that one is declared righteous at a fixed point in time. Righteousness is rooted in the Torah, and has movement, form, and meaning. It is active and powerful to bring about the transformation of conduct. If we have a second look at what Paul wrote to us in Romans and Galatians, we can see how he speaks of faith, righteousness, and the Torah going hand-in-hand together being coupled to faithfulness. He writes with such enthusiasm that he says in Romans 3:31 Do we then nullify the Law through faith? May it never be! On the contrary, we establish the Law. (NASB) Following this statement Paul goes into a deep discussion about the righteousness of Abraham which was based upon faith (see Romans 4). Paul’s interpretation of Bereshit / Genesis 15:6 states “Abraham believed God and was accounted to him as righteousness” is in the form of a Jewish midrash. Paul uses midrash to draw out the deeper meaning of righteousness with Abraham as the example given to us from the Scriptures. Paul urges his listeners to respond in faith like that of Abraham, who pioneered the way to righteousness. The prophet Habakkuk says “but the righteous will live by his faith” (Habakkuk 2:4). He is saying, we will live by our faith, meaning we are putting our faith into action. Living a life of righteousness is a dynamic experience. It is the power of God to live righteous lives in obedience to His word. This is true redemption and salvation because it embraces the new life of walking in the way of the Torah, following God’s ways, walking in the footsteps of the Messiah, following Jesus! As a path to salvation, the way of righteousness is experienced as a present reality that culminates in the coming of God’s Messiah. This is understood in the future expectation of God sending His Messiah, and of the future expectation of the Messiah Yeshua returning. By faith we live illustrates for us a supernatural strength that enables each one of us to participate in the redemptive movement of God, in His Kingdom (Galatians 5:21). According to Paul, the power of God is released for us in our lives by faith in the Messiah Yeshua. In the Torah portion, Adam, Eve, and Cain did not seek God’s counsel for help to overcome. Today, using them as an example from the Torah, we are to seek the Lord God our Father in heaven for help in the name of His Messiah Yeshua. And it is in this way that it is possible to experience God’s redemption in every day life. The Torah speaks of the “life of righteousness” or the “way of righteous living” and according to faith as defined in the Scriptures, our faith is lived out in the way of righteousness as we believe in the Messiah and receive empowerment in our lives from God’s Holy Spirit to overcome sin, to bear God’s testimonies, and to bring glory to His Name! This is how the Gospel and the Torah are connected.